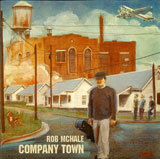 The opening track “Company Town” tells the story of this project. The song offers crisp clear guitars and lyrics that get the mind to consider something besides the circumstance most of our lives are locked into allowing us to focus on other peoples conditions and lives. McHale’s guitar is huge, but his vocal is even larger, somewhere between a low tenor and high baritone. It’s a great voice for his topical tunes. “Eagles and Doves” is assisted by Leroy Lewis on guitars, with Mike Alicke on lead guitar. The mix in this tune is a bit muddied and with a tad too much reverb on vocal, but if McHale’s thought was to show his influences, this tune accomplishes that. I hear shades of Young, J.J. Cale, and many of the best writers of our generation. “A Hole in the Fence” features McHale on resonator slide with a stark vocal that is haunting, and image-filled lyrics of pain of love gone, not to return. “Julia’s Talley House” features Pat McHale on harmonica while McHale weaves another of his stark ballads, a story of the change that we are caught in these days. Nothing lasts forever, but one can always count on change. “High Desert Sun” jumps out with a solo riff giving way to the vocal on McHale’s deep and polished lyric, and a more prominent slide lick, then a second vocalist, Marie Reid, which is a nice touch. “Tom Dula (Set Me Free)” features Sandi Rosen on violin, another sweet touch that works well with the vocals and is placed well in the mix. “When the Water is Gone” features the most production on the project with accompaniment by Mike Alicke on mandolin and guitars and Mike Nolan assisting with vocals. This tune really shows off McHale’s voice and ability to tell a great tale. “Keepers of the Fields” is the big production piece of this project, with Joe Mantione of bass and Chris Dickerson behind the kit. This is some of the best production and certainly the best mixing on the project. After hearing this track, I wondered why McHale didn’t exploit more production of this sort in the telling of the previous tunes. This is a clear, thought-out production that allows a haunting vibe to surround the vocal and lyric, which shapes the story. My choice of cuts on the album for sure, the story told really comes to light and allows me to vest in their plight. “Senorita” again allows vocal, harmonica and guitar to settle back into another stark lyric full of pathos and vivid imagery. “Feels Like Home” completes this project and goes back to the focus McHale envisioned, which is a great lyric wrapped around the vibe of the vocal with stark and immediate production. Rob McHale recorded this with sparse production to allow the lyrical content to take center stage, but when he uses players and production the tunes are made more vivid. Though I really liked this project, I wish there were a bit more production to illuminate the plights McHale sings of so masterfully, and help us grasp his articulate lyrics. Next: CD Release – ‘Fields’ Is Available Now!